See Wake up!, The Beast of Keith, Big-cat hunter on the wrong track, Jury still out on big cat, Big Cat remains elusive but fan speaks out and Beast of Kingston spotted again for additional sightings in this area. Kingston, Moray. A large panther was seen on the road area going up the Lein when me and my girl friend seen it sprinting towards the bushes at a rate that no animal I know of here can run, because it got frightened by the noise of the car. It was about 3-4 ft in height and very large, when we went up there for a walk about an hour later there was big cat pug marks on the rd they were about 4 "in diameter. 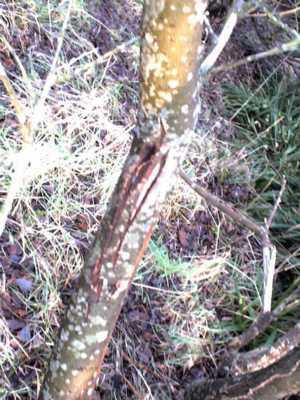 I have some pictures of scratches on the trees up the Lein. Hope they can help you. Do you have any details as to the dimensions of the scratch marks - what height do they start and stop above the ground? I do know there are some people on the list from the U.S and Canada that would probably be more familiar with Big cat teeth. I have just checked out your pics. Very interesting. The scratch marks look more like gouges. 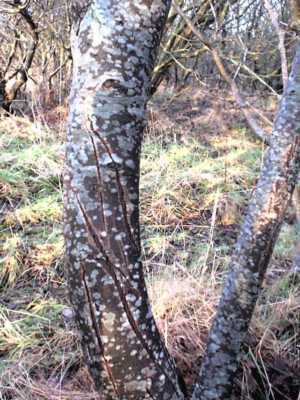 I have seen several trees in Somerset woodlands with big cat scratch marks on them. They are just that - scratches - not gouges. Are there big deer around the woods where this tree is in the pic ? Was a big deer having a go at the tree with antlers ? Or was a forester or some other person ? The pics were taken by a friend of mine and while they are indeed too large, when they originally appeared they were just that, scratch marks. The tree has grown since and D, who took the pics was there about a year after they were first spotted.